Listening to the opening narration delivered in "The Lord of the Rings: The Fellowship of the Ring," I was instantly swept back into the archaic but opulent realm of J.R.R. Tolkien's Middle-earth, where hobbits, elves, dwarfs, wizards and mortal men became united in their quests to save the lands they loved from almost certain destruction. It was a place I had not visited for quite some time, and yet one where I could still clearly visualize the lush landscapes that hedged the ambitious journeys of the story's endlessly colorful characters. That's because Tolkien's work in his "Lord of the Rings" trilogy is likely the most vivid and enduring material ever created in fantasy literature, work that transcends all boundaries of time and storytelling and flourishes off the imaginations of its readers. Those of us who read the books are instantly enraptured, and few, if any, admirers are able to forget the experience. Of course, everyone's idea of what a Middle-earth looks like are very seldom similar to one another, and that's the immediate difficulty with Peter Jackson's long-awaited interpretation of the famous novels. His primary job as the trilogy's director isn't as much about the players or the events as much as it is about the approach to the landscapes; many could probably tell the stories successfully, but to what avail if they lacked the zealous texture? Jackson, thankfully, is a man who knows the material and its crucial success factors very well, and he portrays Tolkien's realm of swords and sorcery through an eager and fresh eye. The result doesn't always echo our own perspectives, but is thoroughly satisfying. Furthermore, the movie is without a doubt the most remarkable cinematic achievement of the past year, a stunning marriage of elaborate visuals, exciting adventures, fantastic and faithful writing, memorable characters and stellar and inventive execution. It could not have been more of a masterpiece if Tolkien had directed it himself. At the opening of the film, a detailed back history of the events we're about to see is firmly established, mainly to help viewers who are new to the material understand the situation they've walked into. It is told that the leaders of major kingdoms of Middle-earth—lands belonging to elves, humans, dwarfs, etc.—were given rings of power to anchor their authority over their races. However, a ruthless and despicable demon named Sauron, seeking control of everything, forged a ring of his own in the depths of Mt. Dune, a violently active volcano at the center of his realm. This one particular ring possesses powers so great and deadly, he who wears it has command over everything in the world. Sauron used this circumstance to its ultimate benefit, and one by one the realms fell into his control, bringing about a dark age for all of Middle-earth. Eventually he was challenged by opposing forces, but the power of the ring itself persisted, making the dark lord almost invulnerable to attacks from rebels... until a mortal caught Sauron off-guard and slashed the demon's hand off, collecting the ring as a memento. Unfortunately, the urge for power and greed possessed the man so greatly that he refused to destroy the artifact, a factor that ultimately lead to his own death. The ring eventually disappeared into the depths of the river, but hundreds of years later it surfaced, still as mighty as ever, waiting for its master to return to it and regain control over the land. 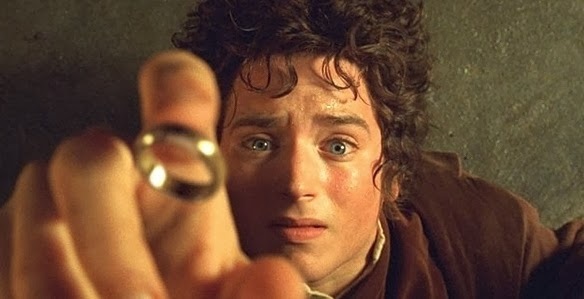 Alas, the ring eventually falls into the hands of Frodo Baggins (Elijah Wood), a hobbit who, like most of his kind, lives in a strange, tidy burrow on the side of a hill, in a village that hobbits call the Shire. Also like most other hobbits—which are short little creatures with hairy feet and pointy ears—Frodo leads a simple and secluded life away from war and magic, so he doesn't quite know of the potentially-destructive capabilities this powerful artifact holds. He is guided by a wizard named Gandalf (Ian McKellen), who instructs Mr. Baggins and his close friend, Sam Gangee (Sean Astin), to flee their lives in the shire before Sauron's forces catch them with the ring. The books are successful in countless ways, but at the heart, they're enjoyable simply because they involve lots of traveling and questing. The movie utilizes this aspect to a spectacular degree; in between crucial plot twists, fast-paced action sequences and impertinent dialogue exchanges, the sense of adventure takes us to several familiar corners of Middle-earth, including Rivendale, a lush city that hugs the side of a cliff pierced by dozens of waterfalls, and Eisengard, a nesting ground for a brewing army of menacing Orcs. Jackson and his talented crew of artists build these locales with elaborate and distinctive special effects, layering them so realistically that they practically jump out at you. Likewise, the creatures who inhabit the environments—most notably the Wraiths, which are cloaked figures riding black and foreboding steeds—are so well-presented that they heighten the sense of tension. Not surprisingly, the screenplay remains faithful to its source material, following the plot outline of the first book as well as can be expected. Furthermore, it juggles its characters with striking effort, developing them and their personal stories with just the right amount of detail. Of course, the fact that this endeavor is only part of a trilogy will surely frustrate several viewers, who will walk out of the theater wondering how any filmmaker could get away with giving us an ending so dubious and anti-climactic. But those of us who knew of the material should have seen this component coming; Jackson filmed all three movies back-to-back, and considering the second chapter will be released merely a year from now, it's natural to assume why he left us with a cliffhanger. If anything, the resolution will only encourage newbies to read the books before the next film comes out. "The Lord of the Rings" trilogy was filmed over the course of two years in New Zealand, with a budget estimated around $300 million. Looking at the first film, we can see why Jackson chose this country for his shooting location, as the hills, mountains and natural rock formations there seem to share eerie similarities with the world described in Tolkien's work. He has also taken great aim at casting suitable faces in the roles of the well-known characters. McKellen, for instance, looks and sounds like the Gandalf many of us have imagined, and Cate Blanchett, who takes on the role of Galadriel, the elf queen, looks, acts and feels like the most appropriate cast in this very placid, ominous role. I went and saw "The Fellowship of the Ring" with high expectations, and they were drastically exceeded. Hopefully yours are, too. This is one of the superb epics of our time, joining the company of "Lawrence of Arabia," "The Wizard of Oz," "Ben Hur," "Star Wars" and "Titanic" as one of the immediate benchmarks of our cinema.